Built for hauling rockets aloft to launch satellites, the world’s biggest airplane landed Saturday after a widely-anticipated test flight over California’s Mojave Desert, six months after the death of billionaire benefactor Paul Allen clouded the future of the project. The dual-fuselage, six-engine aircraft took off from the Mojave Air and Space Port shortly at 6:58 a.m. PDT (9:58 a.m. EDT; 1358 GMT) and flew for about two-and-a-half hours, reaching an altitude of around 17,000 feet (5,200 meters) and a top speed of 189 mph (304 kilometers per hour), the company said in a media briefing after the flight. The Stratolaunch aircraft, nicknamed “Roc,” is designed to carry rockets high into the atmosphere, providing a head start in altitude and velocity for satellites going into orbit around Earth. Stratolaunch’s airplane has a wing span of 385 feet, or 117 meters, breaking the record for the widest wing span on an aircraft set by the Hughes’ propeller-driven H-4 Hercules, or “Spruce Goose,” flying boat, which made a single brief test flight in 1947. 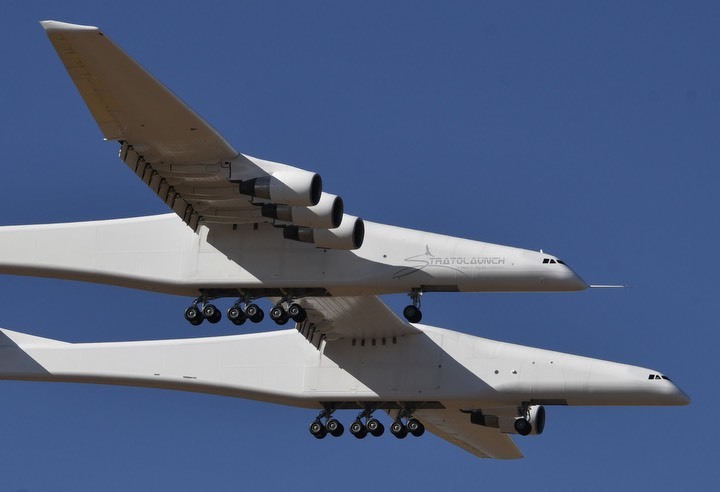 Powered by six engines from Boeing’s 747 jetliner, the Stratolaunch aircraft is 238 feet (73 meters) long and has a maximum takeoff weight of 650 tons (590 metric tons), according to information on the company’s website. Stratolaunch’s airplane is not as heavy as the Antonov An-225 cargo plane, but its wing span is nearly twice that of the 747 jumbo jet. The plane returned to landing at Mojave, where engineers from Scaled Composites assembled the aircraft over the last few years. Saturday’s flight came after a series of ground checkouts that culminated in high-speed taxi tests early this year. Stratolaunch is part of Vulcan Inc., a holding company established by Microsoft co-founder Paul Allen. The project was unveiled in 2011, when officials said the huge airplane would make its first flight in 2015 or 2016. The project was originally conceived as a partnership between Allen, SpaceX’s Elon Musk, and Burt Rutan, founder of Scale Composites, the designer of Virgin Galactic’s SpaceShipTwo suborbital space plane. But SpaceX stopped work on its air-launched rocket concept in 2012, and Stratolaunch entered into discussions with Orbital Sciences to develop a bigger version of the company’s Pegasus rocket. 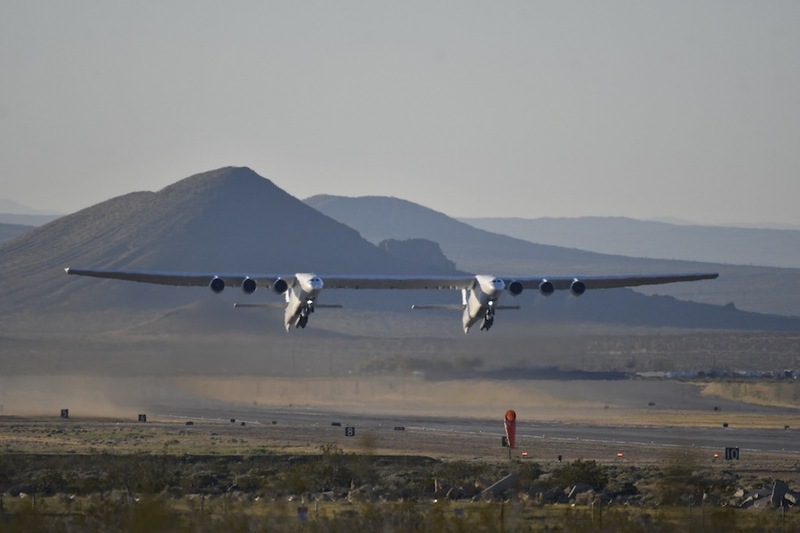 Stratolaunch eventually decided against that idea, and in 2016 announced that Orbital ATK’s baseline Pegasus XL rocket would launch from the company’s gigantic airplane. Up to three Pegasus launchers could be mounted under the Stratolaunch aircraft on the same flight. Pegasus rockets currently launch one at a time from a Lockheed L-1011 carrier jet. The solid-fueled Pegasus rocket has launched 43 times on satellite delivery missions since 1990. 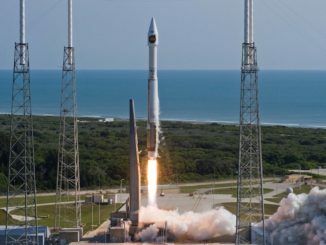 The Pegasus program is now owned by Northrop Grumman, which acquired Orbital ATK last year, following the 2015 merger of Orbital Sciences and the space and missile divisions of Alliant Techsystems. Northrop Grumman is also the owner of Scale Composites, the designer and manufacturer of the Stratolaunch airplane. Last year, Stratolaunch announced a roadmap for its own rocket family, beginning with a Medium Launch Vehicle that could debut in 2022 and lift up to 8,000 pounds (3,400 kilograms) of payload into low Earth orbit. 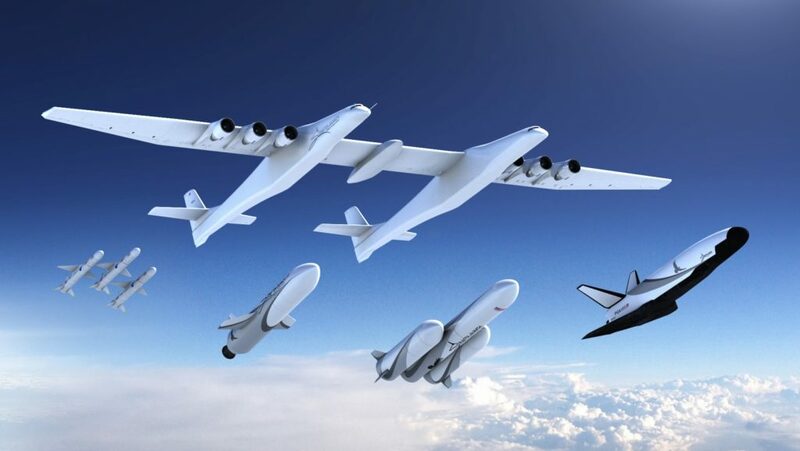 Stratolaunch also revealed plans for a heavy-lift launcher and a space plane that could fire into orbit after a high-altitude drop from the aircraft. Allen died last October from complications of non-Hodgkin’s lymphoma, and Stratolaunch said in January that it was ending development of its own rockets. “We are streamlining operations, focusing on the aircraft and our ability to support a demonstration launch of the Northrop Grumman Pegasus XL air-launch vehicle,” a Stratolaunch spokesperson said in January. 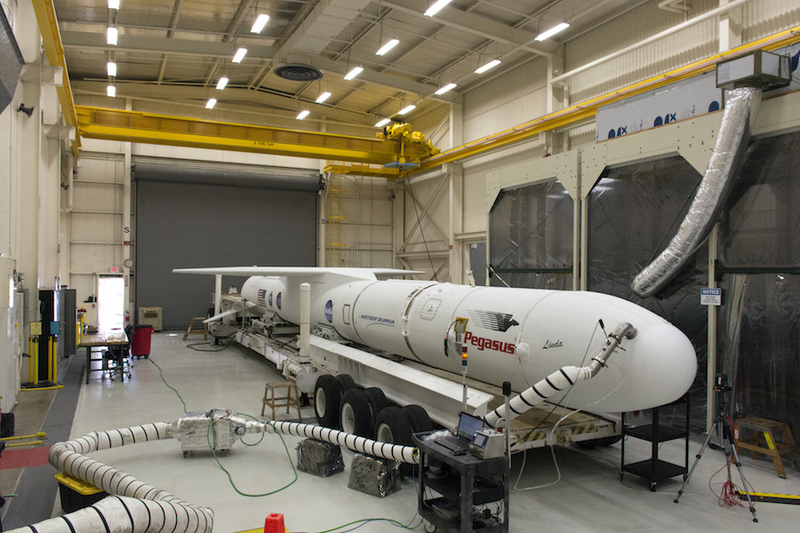 A Northrop Grumman official told Spaceflight Now last year that rocket motors for two Pegasus XL rockets purchased by Stratolaunch were delivered to Northrop Grumman’s facility at Vandenberg Air Force Base in California, where the company assembles Pegasus launchers for flight. The Pegasus XL demonstration launch with Stratolaunch was expected in 2020, officials said last year. In a press release after Saturday’s flight, the company said the aircraft’s reinforced center wing can accommodate multiple launch vehicles. But Stratolaunch provided no updates on future test plans Saturday. Company officials did not take questions from reporters in a media conference call after the aircraft landed. Other than Northrop Grumman’s agreement with Stratolaunch, there’s only one confirmed Pegasus XL rocket mission on contract. That mission will carry NASA’s Ionospheric Connection Explorer, or ICON satellite, into low Earth orbit later this year, following more than a year of delays caused by technical issues on the Pegasus rocket. 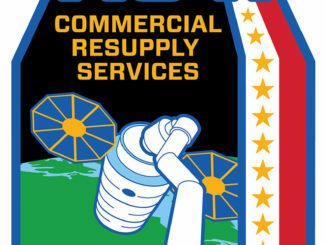 The last two Pegasus launch contracts awarded by NASA cost more than $50 million. The Pegasus rocket can deliver a payload of up to 815 pounds (370 kilograms) to a 250-mile-high (400-kilometer) orbit. While Stratolaunch’s future is cloudy, the market outlook for the Pegasus rocket also appears somewhat rocky. There are numerous rockets in development by startup space companies that could haul a similarly-sized satellite into the same orbit, at a fraction of the cost of a Pegasus mission. 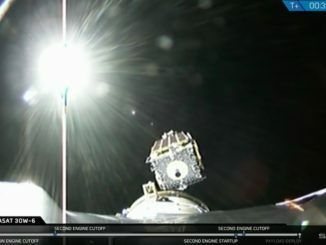 But the Pegasus rocket remains the world’s only air-dropped satellite launcher, an attribute touted as adding flexibility for satellite operators needing to launch into unique orbits. Virgin Orbit’s LauncherOne will attempt to become the second orbital-class air-launched rocket later this year. Stratolaunch said pilots evaluated aircraft performance and handling qualities Saturday. The pilots performed a variety of flight control maneuvers to calibrate speed and test flight control systems, Stratolaunch said in a statement. The maneuvers included roll doublets, yawing maneuvers, pushovers and pull-ups, and steady heading side slips. The flight crew also conducted simulated landing approach exercises, according to Stratolaunch.